THE Scottish government is to propose that the removal of nuclear weapons should be a legal requirement in an independent Scotland, Nicola Sturgeon has revealed. 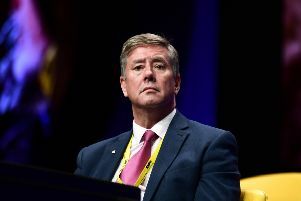 SNP ministers believe that removing nuclear weapons from Scottish territory should be included in an independent Scotland’s interim constitution – a move that would put a constitutional duty on the Scottish Government to negotiate ­towards taking Trident out of the Clyde. The draft interim constitution, which will be published for consultation shortly, will set out how an independent Scotland could prepare a written constitution. The inclusion of a commitment to getting rid of Trident follows suggestions that the nuclear deterrent could be used as a bargaining chip in the Scottish Government’s post-independence negotiations with the rest of the UK. By hardening its stance on the removal of the nuclear deterrent, housed at the Faslane Naval base, the Scottish Government is attempting to counter suggestions that its anti-nuclear weapon policy might become a casualty of negotiations to break up the UK. With Westminster attempting to play hard-ball on its refusal to allow an independent Scotland to share the pound, theories have been advanced that the SNP’s anti-nuclear stance could be traded in return for a deal on sterling. The Scottish Government’s critics have argued that the SNP’s non-nuclear stance is at odds with its desire for an independent Scotland to be a member of Nato, an alliance based on a nuclear defence umbrella. The SNP have countered saying that other countries without a nuclear deterrent have joined Nato. Lord Robertson of Port Ellen, the former secretary general of Nato, said: “The SNP appear to be putting more and more barriers up against future Nato membership. There are certainly non-nuclear members of Nato but there are no anti-nuclear members.